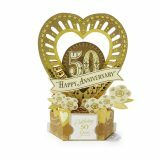 Send heartfelt congratulations to an amazing couple celebrating their golden anniversary with this beautiful pop up greeting card. A gentle squeeze of the base turns this card into a three-dimensional piece of displayable art decorated, appropriately, with gold foil accents. Sign the removable, foil-stamped mini card that tucks into the card base to preserve the papercraft memento for the happy couple to enjoy again and again. Wonderfolds bring a whole new dimension to card giving.